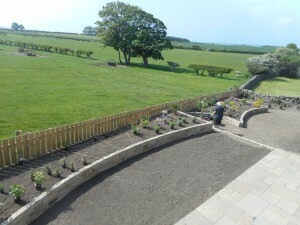 This spring I worked for a great clients near Seahouses who had always dreamed of a great garden to go with their beautiful contemporary house design, with balcony views looking across fields and down to their garden below. 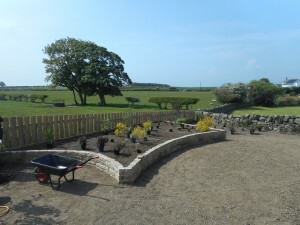 We had excellent discussions and we created a plan which structured the garden with perennials nearer the house opening to more shrubs as you reach the further western edge and focusing on shapes and colours which could be viewed from above. 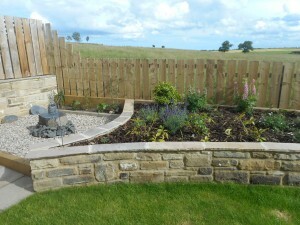 We used low stone walls to unify with the house and capped them and curved them to create patterns from above. Although this is contemporary the idea of creating shapes to view from above was popular in Tudor gardens as the rich walked along first floor galleries and tried to stay inside when it was fashionable to have pale skin! We organised the garden into a more functional section nearer the house with a water feature and patio area and the design echoed the idea of openess of view with and then broken with a low wall into a second sections dominated more by shrubs lowering maintenance and designed to visually break up the view of the fence. 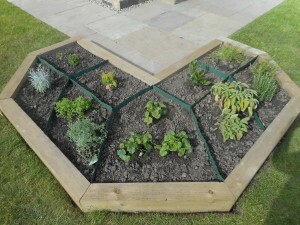 In the lower garden a herb bed was planted and an apple tree on a rootstock limiting size to about 8′. The photos show landscaping as it unfolded. 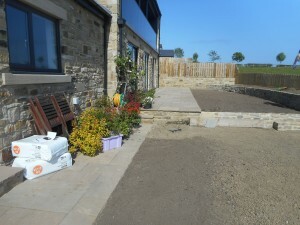 I think with all designs its important for the garden to echo the external environment and compliment the house itself. Although I would consider garden design an art, it is also a science as the plants need to thrive and be in such good health that they flower well and grow strong. A healthy garden is also a brilliant space to work and play in, a fantastic investment for the future.